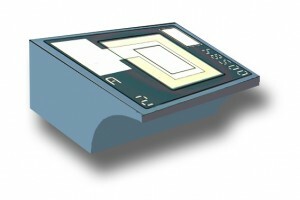 Side illuminated monitor photodiode chip that has a curved side facet and a large active area for monitoring the optical output emitted from the backside of edge emitting lasers. This side illuminated monitor photodiode is optimized for monitoring FP or DFB lasers used in single-mode data- and telecom applications as well as EDFA pump lasers. The monitor diode offers excellent responsivity in the wavelength region from 980 to 1620 nm. The incoming laser light is refracted by the curved side facet onto the active area. Thanks to this unique side facet, a bulky and expensive “wrap-around” submount is not required.